today's photo is part of susan of art spark theater face/plant challenge. I can't take responsibility for the face, other than framing the photo. 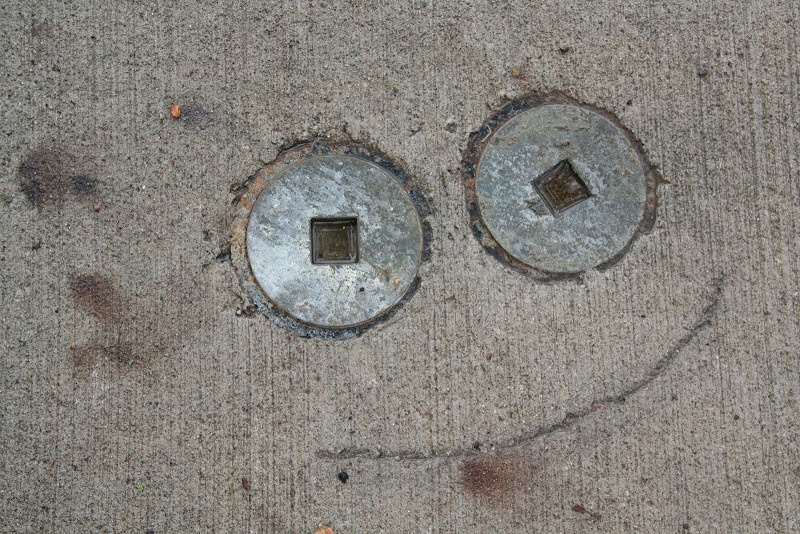 I encounter this happy face on my walk to the library. the first time I saw it, it brightened my day and ever since has become a kind of talisman - I love seeing how the light and seasons play with the expression of this sidewalk face. the first time ever I saw your face became a hit in 1972 and since has become a roberta flack classic. however, as we learn in this vid, the song was written in 1957 by scottish singer/songwriter ewan maccoll for peggy seeger - who later became his wife. however, according to the portal an alternative story behind the song is that a friend challenged ewan to write a love song, devoid of politics, and this song was the result. whatever is the case, like a smile, this is an infectious song. the first time ever I saw your face seems to have been covered by everyone from peter, paul and mary to johnny cash to harry belafonte and lena horne to elvis to isaac hayes - to name but a few. That's a sweet face to see so often, thanks for finding it. Great picture and a nice little video. Ewen McColl is greatly missed, I remember seeing him perform at clubs in London in the late sixties and early seventies. His first wife was the director Joan Littlewood who was responsible for one of the finest satirical musicals ever produced, "Oh What A Lovely War"
Lovely face, and a great photograph of it. You taught me something. I thought it originated with Ms. Flack. I've never heard it performed by anyone else either. Interesting story behind the music. PP&M always a delight. They look so young there! :-) Always love P.P.&M - thanks mouse! I think I'll go looking for some man-hole covers tomorrow so I can do some art too. It has been a long time since I saw a video with Peter, Paul and Mary at such young ages. Great video. Lots of fun to watch this. I was at first gig Ewan did with Peggy Seegar - very "fall in loveable". They started an affair, but Peggy had "what am I doing, he's married" moment & returned to States. Ewan could not follow, barred as "Commie", sang this song to Peggy on phone, persuaded her to return. Song was very special to both hence delay in recording it.